Beware: Kimkins Diet is Dangerous!! Scamkins: Don’t be fooled by Kimkins! PLEASE READ THIS NOTICE CAREFULLY. YOUR RIGHTS MAY BE AFFECTED BY A CLASS-ACTION LAWSUIT THAT IS CURRENTLY PENDING IN RIVERSIDE COUNTY SUPERIOR COURT, IN RIVERSIDE, CALILFORNIA. 1. On May 20, 2009, the Riverside County Superior Court, located in Riverside, California, issued an order certifying this case to proceed as a class action. 2. 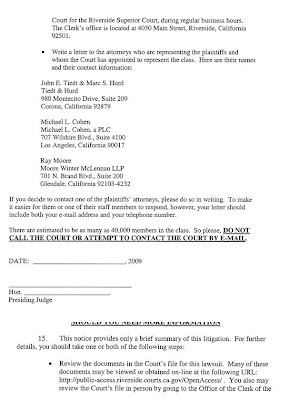 The plaintiffs are six individuals who bought memberships to kimkins.com through the kimkins.com Website (www.kimkins.com) from January 1, 2006 to October 15, 2007. The defendants are Heidi Diaz, an individual, and Kimkins (also known as Kimkins.com), a business entity that conducts business in Corona, California. 3. 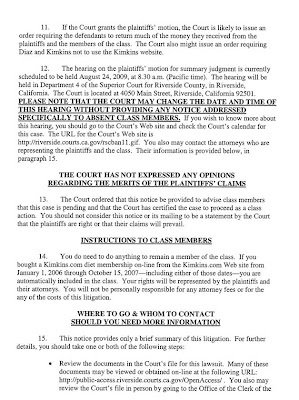 The plaintiffs contend that Diaz and Kimkins.com induced them into buying memberships for kimkins.com through false and misleading information provided on the Kimkins.com Web site. The plaintiffs contend that the defendants violated California Business & Professions Code § 17200, et seq., which authorizes courts to provide relief from unfair, unlawful, and fraudulent business practices. The plaintiffs also contend that Diaz and Kimkins.com violated common law prohibitions against fraud and negligent misrepresentation. 4. This notice provides you with information regarding the litigation, including the plaintiffs’ claims against the defendants and the current status of the litigation. This notice also provides you with information regarding the court’s class-certification order. 5. This lawsuit is based on the plaintiffs’ claims that Diaz and Kimkins used unfair, unlawful, or fraudulent business practices to induce them into buying memberships to Kimkins.com. 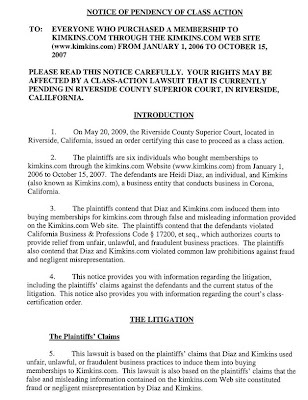 This lawsuit is also based on the plaintiffs’ claims that the false and misleading information contained on the kimkins.com Web site constituted fraud or negligent misrepresentation by Diaz and Kimkins. • that Diaz and Kimkins intended to mislead potential members and assumed that potential members would rely on her misrepresentations. 7. Diaz and Kimkins have denied all allegations of wrongdoing and liability, and they continue to deny that they have done anything wrong. Diaz and Kimkins also have asserted various affirmative defenses to the plaintiffs’ claims. 8. In an order filed May 20, 2009, the Court granted the Plaintiffs’ Motion for Class Certification. The Court certified for class treatment the plaintiffs’ claims for equitable relief, including disgorgement of the subscription fees paid to Diaz and Kimkins by the plaintiffs and the members of the class. 9. The certified class is defined as all individuals who purchased the Kimkins.com diet membership on-line from the Kimkins.com Web site from January 1, 2006 through October 15, 2007. 10. The Court ordered that this notice be provided to advise class members that this case is pending and that the Court has certified the case to proceed as a class action. You should not consider this notice or its mailing to be a statement by the Court that the plaintiffs are right or that their claims will prevail. 11. You do not need to do anything to remain a member of the class. If you bought a Kimkins.com diet membership on-line from the Kimkins.com Web site from January 1, 2006 through October 15, 2007—including either of those dates—you are automatically included in the class. Your rights will be represented by the plaintiffs and their attorneys. You will not be personally responsible for any attorney fees or for the any of the costs of this litigation. 12. You have the opportunity to opt out of the class action lawsuit as detailed herein. If you incurred a personal injury as a result of using the Kimkins.com aka Kimkins Diet, you have a right to opt out. Notices to opt must be sent to jtiedt@tiedtlaw.com or mailed to Tiedt & Hurd at 980 Montecito Drive, Suite 209, Corona, California 92879. • Review the documents in the Court’s file for this lawsuit. Many of these documents may be viewed or obtained on-line at the following URL: http://public-access.riverside.courts.ca.gov/OpenAccess/ . You also may review the Court’s file in person by going to the Office of the Clerk of the Court for the Riverside Superior Court, during regular business hours. The Clerk’s office is located at 4050 Main Street, Riverside, California 92501. If you decide to contact one of the plaintiffs’ attorneys, please do so in writing. To make it easier for them or one of their staff members to respond, however, your letter should include both your e-mail address and your telephone number. There are estimated to be as many as 40,000 members in the class. So please, DO NOT CALL THE COURT OR ATTEMPT TO CONTACT THE COURT BY E-MAIL. From Inside Kimkins, Kimmer (aka Heidi Diaz, or Kimberly Drake, or whomever she is today) begins to attempt to do some damage control, after news of her bankruptcy was revealed. corporation or sole proprietorship, and to individuals. understand. Those plans have been in the works for several months. We’re a big website (bigger than what you see) and it’s a big project! person and months are not instant! Darn! find the boo boos before we switch everybody over. previous “looks” since we started Kimkins in April 2006! What she doesn’t tell them in this note is that she has already started a NEW diet site, which is no longer low carb. It appears to still be low calorie and low fat. It also appears to be using a name that is already trademarked to another company. It appears that it is NOT all smooth sailing over at Kimkins. Apparently, the looming litigation has gotten a little too close for comfort for Ms. Diaz, just as if it were a giant iceberg sighting, dead ahead. Heidi Diaz, without an attorney, was facing a certification hearing for the Kimkins Class Action Lawsuit on January 14th. To avoid this, she has now filed for Chapter 11 Bankruptcy protection. This drastic action is much like a call for help from a doomed ship. What does this mean for the Class Action Lawsuit? It means that the case in Riverside Court is on hold, and things will now play out in Bankruptcy Court. But what about Bert Cottle? Has he been paid for all services rendered or is Ms. Diaz trying to get out of that too? What about the countersuit that she filed? Not to worry though, Kimkins Class Action Lawsuit Attorney, John Tiedt, has made it clear that he isn’t about to give up on this, no matter what kind of stunts Ms. Diaz may pull next. Stay tuned for the next installment in the continuing saga of the Kimkins Diet Scam. So, did Bert Cottle voluntarily jump overboard to escape Heidi Diaz and her dangerous diet scam or was he encouraged to walk the plank by the tip of a sword? Surely more details will be forthcoming soon, but many are speculating that Bert finally realized how deeply in trouble he’d become by representing Ms. Diaz. Or did Kimmer dump him because he simply wasn’t up to the task? After all, getting away with diet fraud IS a difficult challenge. Others propose that he simply left Ms. Diaz’s side because she just can’t afford to pay his legal bill. One can only wonder if Mr. Cottle will be the next person that Ms. Diaz decides to sue in the ever growing Kimkins litigation. What will Kimmer do without her trusty legal beagle by her side?? Stay tuned to see if he sinks or swims, and what will happen now that there is no one at the helm of Heidi’s defense. about the Kimkins Diet Scam. Click on the Insider Logo to view the show! of the same show on YouTube and AOL Video. Thank you, Elle! We greatly appreciate your hard work!